The latest range of Turnkey Kitchen Equipment incorporates the classiest equipments to transform the conventional commercial kitchen to a contemporary one. A typical kitchen of a restaurant includes different workstations. A workstation is an area where a specific type of food is prepared or a certain cooking technique is followed. The stations help in keeping the kitchen clean and running the kitchen works smoothly. The number of workstations is dictated by what is mentioned in the kitchen’s menu. A commercial kitchen has different stations with particular equipments. More than one equipments of the same category can be there in one workstation to make the same stuffs in more quantities at a time. The space and budget are the two major factors to determine the number of stations in the commercial kitchen. One or more stations can sometimes be combined in order to save both money and space. This depends on the size of the kitchen. By combining the stations, one doesn’t have to move to every different station during the slow shifts. 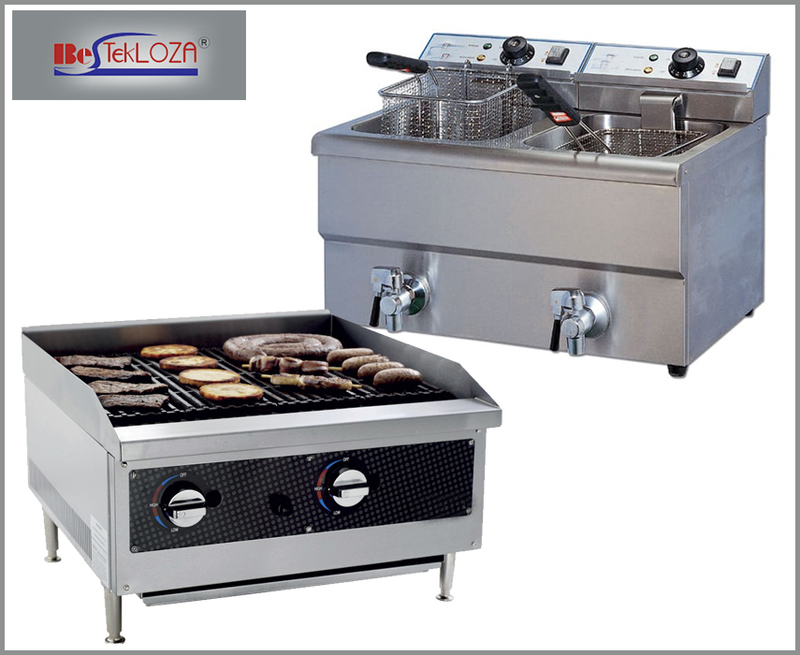 The two main stations of a modern commercial kitchen are the grill station and the fry station. The equipments incorporated in these two zones are the Grillers and Fryers. The grill station comprises of a griller that can be the char broiler or the flattop, a cooler for the grilled bites like chicken, kebabs, beef, etc., grill brush, tongs, and everything required to prepare a grilled dish. The chef appointed for cooking the grilled delicacies using the advanced griller should have enough experience to handle the most updated grilling equipment. The chef must be able to cook and serve several grilled dishes at a time. He or she also must know how to set the temperature for cooking different ingredients. Over the last few years, a trend has been seen towards the healthier grilled foodstuffs. Grilled items are more in demand now than the normal deep fried bites. Even the chains of fast-food centers have drifted towards the grilled versions of their deep fried lineups in order to fulfill the current demands of the masses. From the flat grillers to the char broilers, the online store includes everything needed to grill up the favorite munches of the customers. The fryer is used for frying different ingredients like chicken wings, French fries, onion rings, etc. Since the raw ingredients that are put inside the fryer are frozen so most of the fry stations have a separate freezer in the same section. Fryers are the keystone equipments in the commercial kitchens. From the crispy potato wedges to the tender and crunchy chicken pakoras, ample of fine dining and fast casual bites all need the use of deep fryers especially when huge number of customers have to be served. A deep fat fryer is an equipment that is considered to be the chief reason of the commercial kitchen fires. There are mainly two reasons for this. The first risk arises from the grease temperature that is being used for frying. With the increase in the temperature of the grease, the risk of the grease fire also increases. The grease must be kept at a temperature below 375 degrees Fahrenheit. The fryer should incorporate a device, which will shut the Turnkey Kitchen Equipment off when the grease temperature exceeds 475 degrees. The next risk that comes on the way is the chances of grease splashing out of the fryer. If other cooking appliances are kept close to the fryer then the grease can potentially reach the open flame and this can be the reason of kitchen fire. In order to avoid this kind of danger, the open flame appliances must be kept a t a minimum distance of 16 inches from the deep fat fryer.